Organic chemistry is the study of carbon-based compounds. It's one of those things that send shivers down some people's spines. However, for the SAT Chemistry Subject Test, we need to worry only about the relatively minor tasks of identifying organic compounds by their names and structural formulas, understanding some organic reactions on a basic level, and being familiar with the four families of biomolecules. Some topics discussed in this chapter are hydrocarbon chains, functional groups, organic reactions, biomolecules, and environmental chemistry. Carbon compounds are especially important because all living things on Earth are made up of carbon (in addition to a few other elements). Each carbon atom can form up to four bonds with other atoms; this enables carbon to form long chains with itself and certain other atoms, which is what makes it such an important biomolecule. Organic molecules almost always contain nonpolar covalent bonds. 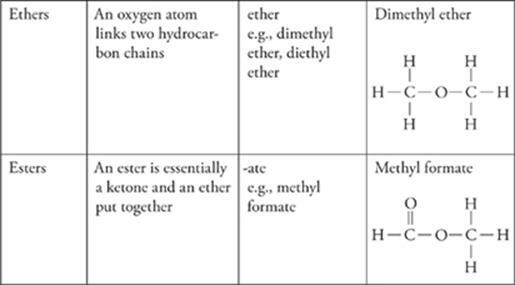 Here are some other properties of organic compounds that you should know. • Organic compounds are much more soluble in nonpolar solvents than in polar solvents. Remember: Like dissolves like, so since carbon compounds are generally nonpolar, they will be soluble in nonpolar solvents. That means that organic substances are not very soluble in water, which is a highly polar solvent. • Organic compounds don't dissociate in solution; since organic compounds do not contain ionic bonds, they will not dissociate into ions. That means that organic solutions are poor conductors of electricity, and organic compounds do not behave as electrolytes in solution. There is an infinite variety of organic molecules. Sometimes two organic molecules may have the same chemical make-up with identical constituent elements, but these elements are arranged in a different geometrical arrangement. In these cases, the two compounds have completely different chemical properties and are said to be isomers. The simplest organic compounds are hydrocarbons, compounds that contain only carbon and hydrogen. Hydrocarbons can be grouped into three categories: alkanes, which contain only single carbon-carbon bonds; alkenes, which contain carbon-carbon double bonds; and alkynes, which contain carbon-carbon triple bonds. Alkanes are hydrocarbons that contain only single bonds. They are also known as saturated hydrocarbons because each carbon atom is bonded to as many other atoms as possible. The prefixes (meth-, eth-, prop-, etc.) indicate the number of carbons in the hydrocarbon chain. Alkenes are hydrocarbons that contain at least one double bond. They are said to be unsaturated hydrocarbons because each carbon atom is not bonded to as many atoms as possible—;the two or more carbons double bonded to one another could theoretically instead bond to other H atoms, for example. Alkynes are hydrocarbons that contain triple bonds; they are also unsaturated hydrocarbons. Many hydrocarbons form rings instead of chains. 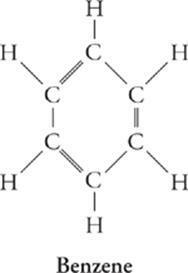 One of the most important classes of these compounds is the aromatic hydrocarbons, the simplest of which is benzene, C6H6. The presence of certain groups of atoms, called functional groups, in organic compounds can give the compounds specific chemical properties. You should be familiar with a handful of organic reactions, so study the reactions below carefully. Addition—;In an addition reaction, a carbon-carbon double bond is converted into a single bond, freeing each of the two carbons to bond with another element. Also in an addition reaction, a triple bond can be converted into a double bond. Substitution—;In a substitution reaction, one atom or group in a compound is replaced with another atom or group. Chemically, this very rarely happens (i.e., direct replacement of H). Polymerization—;In polymerization, two smaller compounds, called monomers, are joined to form a larger third compound. In condensation polymerization, two monomers are joined in a reaction that produces water. Cracking—;In cracking, a larger compound is broken down into smaller compounds. Oxidation—;An organic compound can react with oxygen at high temperatures to form carbon dioxide and water. This reaction should be familiar to you as combustion or burning. Esterification—;In esterification, an organic acid reacts with an alcohol to produce an ester and water. Fermentation—;In fermentation, an organic compound reacts in the absence of oxygen to produce an alcohol and carbon dioxide. in the absence of oxygen. 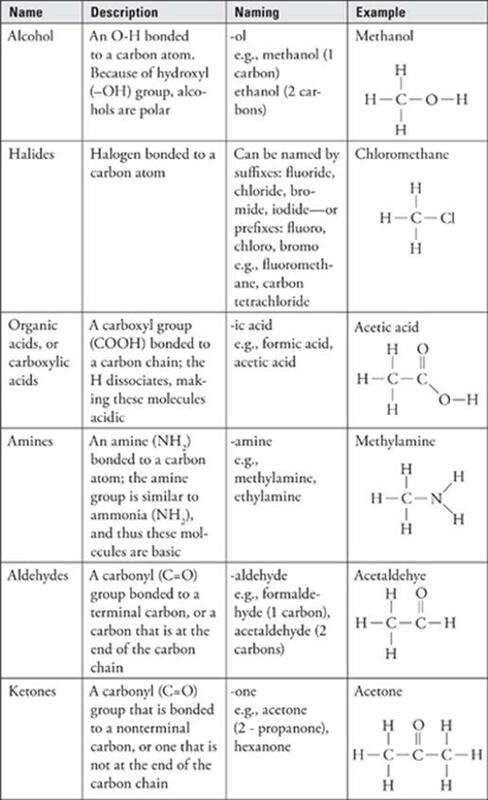 Four important types of organic molecules that you'll hear a lot about if you go into the fields of biochemistry (for instance, if you're planning on being premed in college) or biology are lipids, carbohydrates, nucleic acids, and proteins. All of these biomolecules are carbon compounds, and each of them is characterized by different functional groups, which gives them different functions in the human body. Lipids are made up of carbon, hydrogen, and oxygen atoms, connected in long branching chains. The most common examples of lipids are fats and oils. One group of lipids commonly talked about in biology is the triglycerides. Triglycerides are made up of three long fatty acid chains (long hydrocarbon chains) attached to a head group that consists of a molecule of glycerol. (No need to know the structure of glycerol for the test.) The molecules that make up cell walls are a type of lipid, specifically known as phospholipids. And one final note about lipids: Lipids are not water-soluble and tend to aggregate to form droplets when placed in water. Carbohydrates are also known as sugars; they are organic compounds that contain carbon, hydrogen, and oxygen, usually in a ratio of 1:2:1. They are polymers made up of sugar monomers. Some simple types of carbohydrates are glucose and fructose, for example. Both of these are examples of monosaccharides, carbohydrates made up of just one unit of sugar. Larger sugars, called polysaccharides, are the energy storage units in both plants and animals—;the storage carbohydrate of animals is glycogen, and the storage carbohydrate of plants is cellulose. Carbohydrates can be straight chains of these sugar monomers, or they can be extensively branched. Nucleic acids contain carbon, hydrogen, oxygen, nitrogen, and phosphorus. They are polymers made up of monomers known as nucleotides. There are two major nucleic acids: DNA (which you've probably heard of, stands for deoxyribonucleic acid) and RNA (you might have heard of this type of nucleic acid, too—;ribonucleic acid). DNA is the genetic material of all living things; it contains the blueprints for all life. Proteins are polymers that are made up of amino acid monomers. All amino acids have two functional groups in common—;an amino group (remember, –NH2) and a carboxyl group (–COOH). This means that they are amphoteric and can act as either an acid or a base. All of the 20 different amino acid monomers that make up proteins differ in their side chain or R group. Chains of linked amino acids are known as polypeptides, and proteins are formed by the folding of the polypeptide chains (and oftentimes the association of one or more polypeptide chains). Recall our discussion of catalysts: All enzymes, which are biological catalysts that speed up the rate of nearly all cellular reactions, are proteins. Okay, that's it for organic chemistry—;let's briefly review what you'll need to know about environmental chemistry and then wrap up this chapter! Here we'll cover three main topics that fall under the broad category of environmental chemistry: Earth's atmosphere, the greenhouse effect, and the causes and effects of acid rain. For this test, you should remember that Earth's atmosphere is about 78 percent nitrogen, 20 percent oxygen, less than 1 percent argon, and then contains a trace amount of the following other elements: carbon dioxide, neon, helium, methane, krypton, hydrogen, nitrous oxide, and xenon. While the test won't ask you about the trace elements of the atmosphere, it could ask you about its major components. The atmosphere is divided into four regions: the troposphere, which is the layer of the atmosphere that's closest to the earth; the stratosphere, which is the layer above the troposphere; the mesosphere, which is further out; and then the thermosphere, which is the furthest out of all. This type of reaction is called photodissociation—;in photodissociation, a bond is broken as a molecule absorbs a photon of light energy. In the next step in the production of ozone, elemental oxygen and diatomic oxygen collide. Atmospheric ozone absorbs solar radiation and decomposes back to elemental and diatomic oxygen. If ozone didn't absorb this high-energy radiation, the damaging rays would reach the planet and destroy much of its plant and animal life. As you have probably read about or seen in the news, certain chemicals produced by humans are thought to be responsible for the gradual degradation of the ozone layer. The primary culprits in ozone layer destruction are chlorofluorocarbons, which have been created for use as propellants in spray cans and car air conditioners. Chloroflourocarbons react with light energy to form, among other compounds, free chlorine. This chlorine reacts with ozone to form chlorine monoxide, ClO, and oxygen. The fact that ozone is a reactant in this chemical reaction means that it is slowly being consumed; Earth's atmosphere is slowly being robbed of its protective ozone layer. Another environmental topic that's hotly debated in the news is the greenhouse effect. In short, the greenhouse effect refers to the buildup of carbon dioxide, CO2, and other greenhouse gases in the atmosphere. Greenhouse gases are the result of the combustion of fossil fuels such as coal and oil; they absorb infrared radiation that reflects off the earth from the sun, effectively trapping it in the atmosphere and creating an effect much like that in a greenhouse (hence the name). Other oxides that also contribute to the production of acid rain are the nitrogen oxides, which combine with water to form nitric acid. Acid rain is harmful to buildings and other structures because it reacts with metals and is corrosive. It's also harmful for organisms that live in ponds and lakes; most natural ponds and lakes have a pH of about 7, which is neutral, and a drop in pH has many negative effects on the inhabitants of these bodies of water. In fact, the fall of acid rain has significantly reduced the number of fish and other aquatic organisms in many polluted areas of the world. The last air pollutant that you'll need to know about for this test is carbon monoxide, CO. Carbon monoxide is found in car exhaust and cigarette smoke and can be dangerous for humans because it binds irreversibly to hemoglobin, the biomolecule that is responsible for transporting oxygen around the body through the bloodstream. Okay, we're done with environmental chemistry—;now read through the laboratory chapter, and you'll be all set to take the three practice exams at the back of the book. · Organic chemistry is the study of carbon compounds, and environmental chemistry is chemistry of the environment. · Organic compounds are nonpolar so they don't dissolve in water. · Isomers are compounds that have the same chemical formula (same number and ratios of atoms) but a different geometrical arrangement of atoms. · A hydrocarbon is a compound made of hydrogen and carbon. · Alkanes are hydrocarbons with only single bonds, alkenes are hydrocarbons with at least one double bond, and alkynes are hydrocarbons with at least one triple bond. · Aromatic hydrocarbons are six carbon rings with alternating double bonds. The most common is benzene. · Functional groups are groups of certain atoms that give organic compounds certain chemical properties. · The name of an organic compound is given by a prefix that determines the number of carbon atoms and a suffix that gives the functional group. · The most common functional groups are alcohol (–OH), amine (–NH2), halides (–F/Cl/Br/I), carboxylic acids (COOH), aldehydes and ketones (C=O), ethers (C-O-C), and esters (COO). · The major types of organic reactions are addition, substitution, polymerization, cracking, combustion, esterification, and fermentation. · The four major types of biomolecules are lipids, carbohydrates, nucleic acids, and proteins. · Earth's atmosphere is about 78% nitrogen, 20% oxygen, and less than 1% argon. Carbon dioxide, neon, helium, methane, krypton, hydrogen, nitrous oxide, and xenon are also present in trace amounts. · Ozone, O3, protects Earth by absorbing high-energy radiation from the sun. It is destroyed by chlorofluorocarbons released into the atmosphere by spray cans and car air conditioners. · The greenhouse effect refers to the buildup of CO2 and other carbon gases in the atmosphere. As Earth's surface absorbs solar radiation, it warms and radiates infrared radiation back into the atmosphere. The extra CO2 reflects and traps this radiation, causing Earth to warm. · Nitrogen and sulfur oxides produced by pollution interact with water in the atmosphere to produce acid rain, which is harmful to organisms and human-made structures.